We had a couple of fun outings for Father's Day last weekend! Saturday evening we walked to the square by our house for Dad Fest. 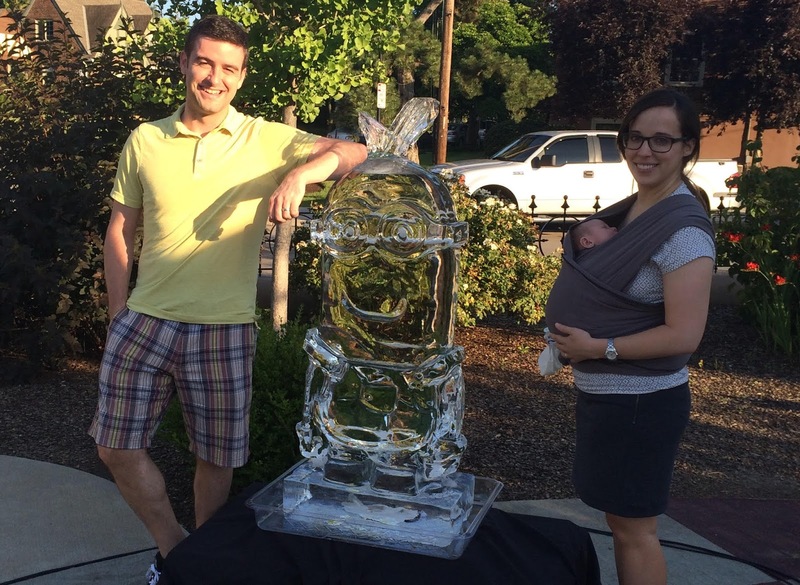 Mae was a bit too young (and a bit too sleepy) to try out the bounce house or face painting, but Dan and I enjoyed getting a tour of a fire truck from our local fire department and watching an ice sculptor carve a giant minion. Sunday was Mae's first trip to the zoo! Dads received free zoo admission for Father's Day so we decided to take advantage. I was a bit worried that Mae would fuss the whole time, but as my mom said, "She's going to cry anyways. What's the difference if she cries at home or at the zoo?" Then Mae managed to sleep the entire trip and did not see a single animal! We had lots of fun, toting her around the different zoo houses and even checking out the new baby cheetah cubs in the nursery! Just a quick comment that this is my 100th blog post. Yay!